Jacob van Artevelde , a merchant turned statesman who brokered an alliance with Edward III during the early stages of the Hundred Years War. Flanders had close commercial ties with England at the time and Artevelde thought it would be very bad for business to be on the wrong side of the conflict. 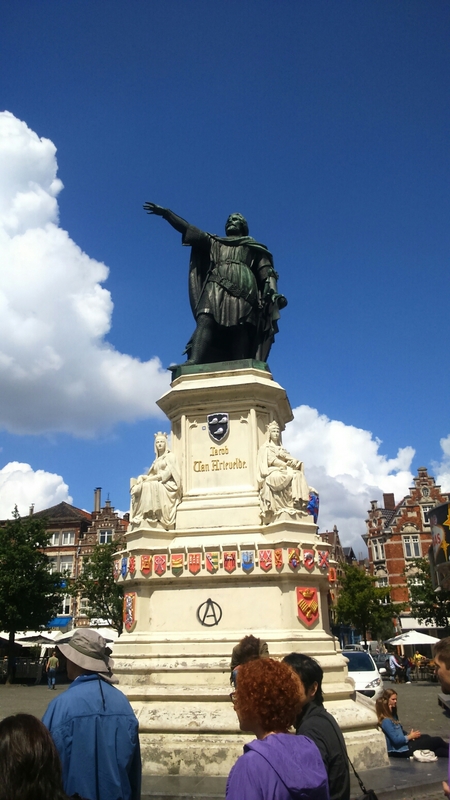 The statue is supposed to show Artevelde pointing in the direction of England, but it isn’t aligned correctly. Artevelde was very close to the Plantagenet royal family. His son, Philip, being the godson of the Queen, Philippa of Hainault, and named in her honour. Incidentally, among the actual sons of Philippa of Hainault was John, who happened to be born in Ghent, which for some reason was rendered in the English of the time as “Gaunt”. John of Gaunt was the first Duke of Lancaster, and founded the House of Lancaster, which gave us Henry IV to Henry VI (inclusive). In fact (or at least in Shakespeare) it was the eldest son of John of Gaunt, Bolingbroke, who deposed Edward III’s successor Richard II and thus became Henry IV..